i love the variety and range of different things that people cook – things that i make as an everyday dish, or find easy to pull together, might be a special occasion dish for someone else; whereas their “old faithful” is untried or a bit scary to me. it’s often more traditional dishes where i have gaps in my experience and “big meat” fits into this category. i think it comes from being vegetarian for a while, not being very keen on the traditional british roast dinner and not wanting to risk wasting money by messing up an expensive joint of meat that i might not enjoy once its done. over the years i’ve been addressing this (if you have the same fear, start with lamb as it tends to be okay you under or over cook it!) and recently i decided to cook my first ham. i know it doesn’t sound like anything complicated but i had so many questions. whether to get a smoked or non-smoked joint? whether to try and find a piece on the bone or not? whether i should be looking for a particular cut of meat? and all that was before i had to work out how to cook it (boiling or roasting?) and what flavours to add - sweet, spicy or herby?? a review of dozens of online recipes suggested that the uncooked gammon (it only becomes ham once it has been cooked, apparently) should be boiled in some sort of liquid (this also helps remove excess salt) and then roasted, with any sort of glaze or decoration added between the two stages (this is when i took the photo above). i decided to cook my boneless, smoked gammon joint in water (rather than cola, ginger beer or cider which were some of the other suggestions i found) with aromatics, as i liked the idea of using the resultant stock to make soup (check your stock isn’t too salty before you do this). i also wanted to try making some sort of glaze and ended up going with the very simple option of (seville orange) marmalade and rosemary sprigs, as suggested in a jamie oliver recipe that i came across. 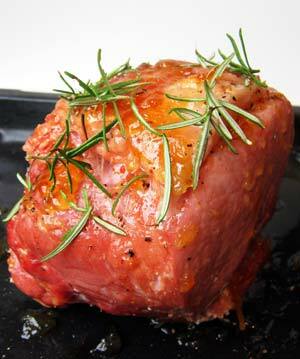 the resulting ham was lovely – both moist and delicious - and is no longer on my scary list!